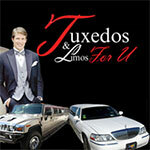 Listed in: Limousine and Suit / Tuxedo categories. Get more for your wedding! Don't forget to mention ChossonKallah.com when visiting Tuxedos & Limos For U. Beautiful servive. The only place in Brooklyn that had the Porche limo I wanted. Definately worth the $$$. Horrible experience!! Would never do business again! The limo driver tried charging us for 2 extra hours when we did not even go over the 4 hours we originally paid for. When we tried to work it out and wanted to call the manager, she followed us into our catering hall and got in our face and was very aggressive. She was shouting in front of our guests and appeared as if she was high or something. We ended up not paying the money because we finished within our allotted time and we had the woman escorted out, but she wasted 30 minutes of our time when we should have been taking pictures with our bridal party. This was the most aggravating thing of the whole night....and I would absolutely never do business with these people again! The most unprofessional service I have ever seen!